Guess the View: You Put Those Benches Back Where They Belong! Hopefully everyone was able to pick up the the subtle Ty Webb/Judge Smails reference in the post title. Also, loved my tour of Vanderbilt University. My grandmother was from Nashville and growing up, my dad was always telling me about the city and university. He called Vanderbilt the “Harvard of the South”, which put the school way out of my league when I was applying to colleges. 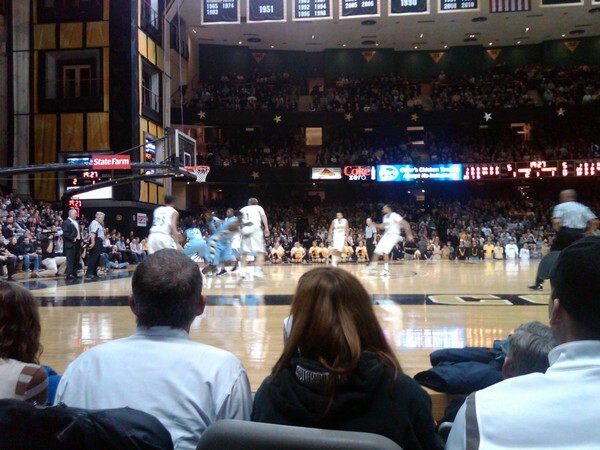 My favorite experience while on the campus of Vanderbilt was the “access” I was given to the athletic facilities. It was the middle of the summer so school was not in session and there did not seem to be many athletic personal patrolling the facilities. I unassumingly walked up to the doors of Memorial Gymnasium, which were unlocked, and made my way directly for center court. Not a sole was their to stop me from walking up to the baseline, pick up a basketball and begin working on my mid range game. It was one of the more surreal experiences of my adult life. Here I was, all alone in the middle of an enormous SEC gymnasium and nobody was there to stop me from perfecting my low post moves. It’s really too bad a Vanderbilt assistant coach wasn’t on hand because I couldn’t miss a shot that day and they probably would have been interested to know that I still had a few years of eligibility left. Today, I love watching basketball games from Vanderbilt. Every time I see that court it brings me back 6 years to when, for a precious 15 minutes, I owned that court.